But the God of all grace, who hath called us unto His eternal glory by Christ Jesus, after that ye have suffered a while , make you perfect, stablish, strengthen, settle you. Regardless of what our calling is, we still have to wait on God to perfect that which is within us before He can send us out to fulfill His will. Patience, for most people and regardless of the situation, is hard to maintain. We do a number of things to try and maintain our patience such as counting to 100 or counting backwards or other little tricks to take our mind off of how ‘ready’ we are to do something or how anxious we are for something to happen. And the tendency is to handle our spiritual calling in God the same way. Patience is a part of longsuffering. When we get the call from God to go or to do or to be a certain thing, we want to rush it. But how many of us understand that sometimes we get the call now but it is for the future? Though we have a sincere heart and a zeal for the things of God, understand that we operate in the timing of God, not our timing. Moving in our own time, you wonder why it’s not working out for YOUR good; Consider that it was never supposed to work out for your good, but it is to work out for good. The good of what? The manifestation of the glory or power of God. Because it is not about us and our wants and desires, but about fulfilling God’s plan and purpose for our lives so that He is magnified, not us! It cannot be stressed enough that we should not allow our impatience to take us to a place that our integrity, knowledge and zeal cannot handle. Rather we know it or not, someone is always watching us and what we are doing and saying. We have excellent examples before us; chief among them Jesus Christ in whom we can pattern ourselves so that we do not shame or misrepresent God. I would like to believe that it is not our intent to make a mockery or bring shame to God but yet that is what happens when we do not patiently wait on God to perfect us. When we think about our call in God, that which we know we have been called to do; from the overseer, to the parishioner, we tend to want to see the manifestation of it instantaneously. For example, if you are called to minister the word of God, you can’t wait to get on the pulpit or behind a podium and give a word or start your own church or be the next world renowned preacher or whoever it is that you aspire to be like or whomever you set up as your role model. But, what if your call to minister God's word is not in the pulpit, what if it is in the fields somewhere in Africa or the chapel in a prison or a seemingly God-forsaken place that you never dreamed you would be? I say seemingly because that’s the way we think, but we have to understand that if God ordained it or purposed it in your life, it is not God-forsaken; He is in it and He is there! Then it becomes imperative that patience is applied; slowing down long enough to get the full understanding of what it is that God wants from us. Standing still long enough for Him to work His will and His anointing in us so that when we get there we don't fail because our desire took us further than our integrity could handle or we didn't allow God the time to prepare the people for us! Don’t stop the good works that you are currently doing; just add to that the prayer that God’s will for you continue to be manifest. Stay in step with God; don’t try to get ahead of Him. Look at Joshua who, though he was called at around 40 years of age, did not step into the manifestation of his calling until he was 80 years old. God had a plan for Joshua that was revealed at the beginning of his walk with Moses. In this account the Amalekites came against the children of Israel. Moses sent Joshua out as the chief commander in this battle. As Joshua was fighting the battle, Moses was back in the camp with his arms lifted up to God and through this, Joshua was able to defeat the Amalekites. What is significant about this is that even while Moses was grooming Joshua as his servant, God was preparing Joshua for his calling. God is now telling Joshua to meditate on those things that Moses had written at the direction of God. That’s another truth – the word of God was written by men, but inspired by God. It is imperative that we read, study, & mediate on the word of God daily; that it become our #1 priority. After we have done this thing, then will we prosper and have good success. ‘You can’t hurry God, no, you just have to wait. You have to trust Him and give Him time, no matter how long it takes. He’ll be there, don’t you worry. 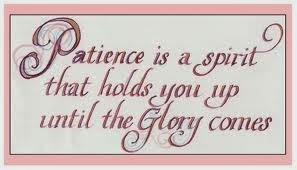 In all things, let us wait patiently upon the Lord so that our will aligns itself perfectly to the divine will of God.